A great book about Noah, with a huge fold-out wall poster showing the ark, plus reusable stickers to decorate it. Follow the story of Noah from the building of the ark to the gathering of the animals and the journey through the flood. Take part in Noah's adventure story by adding stickers to the poster to illustrate the story. Recommended for ages 4 and under. - Publisher These books include a perennial kid favorite--big, easy to handle, reusable stickers--along with a giant fold-out poster. The birth of Jesus and the journey of Noah are presented graphically with images of the fascinating people, places, and events of each story. Readers interact with the stories by adding stickers to the map to illustrate each story. "Follow Noah" is scenes of Noah building the ark. 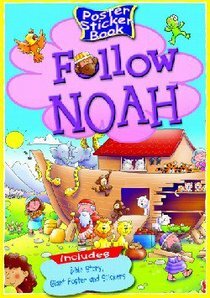 About "Follow Noah (Poster Sticker Book Series)"
These books include a perennial kid favorite--big, easy to handle, reusable stickers--along with a giant fold-out poster. The birth of Jesus and the journey of Noah are presented graphically with images of the fascinating people, places, and events of each story. Readers interact with the stories by adding stickers to the map to illustrate each story. "Follow Noah" is scenes of Noah building the ark.